WASHINGTON, DC, December 10, 2009 (ENS) – A new technical guide to help federal agencies minimize the impact of federal development projects on nearby water bodies was issued Wednesday by the U.S. Environmental Protection Agency. The guidance document was written in response to a change in law and an Executive Order signed by President Barack Obama, which calls upon all federal agencies to lead by example to address a wide range of environmental issues, including stormwater runoff. Under the new requirements, federal agencies must minimize stormwater runoff from federal development projects to protect water resources. Agencies can comply using a variety of green infrastructure or low impact development practices. These technologies enhance or mimic the natural hydrologic cycle processes of infiltration, evapotranspiration, and use. EPA worked with other federal agencies to develop the guidance document, which provides background information, key definitions, case studies and recommendations on meeting the new requirements of the Energy Independence and Security Act of 2007. In December 2007, Congress enacted the Energy Independence and Security Act of 2007. Section 438 of that law establishes strict stormwater runoff requirements for federal development and redevelopment projects. Section 438 requires federal agencies to develop and redevelop facilities with a footprint that exceeds 5,000 square feet in a manner that maintains or restores the pre-development site hydrology to the maximum extent technically feasible. In addition, on October 5, 2009, President Obama issued Executive Order 13514, Federal Leadership in Environmental, Energy, and Economic Performance, which sets a policy that federal agencies “conserve and protect water resources through efficiency, reuse, and stormwater management.” The Executive Order required EPA to issue guidance on the implementation of Section 438 by December 5, 2009. Federal agencies have many alternatives for meeting the requirements of Section 438. At its own facilities, EPA is using sustainable techniques for reducing the effects of stormwater runoff, such as installing green roofs as well as using rain gardens and cisterns to capture and reuse stormwater. Federal agencies can also use footprint-reduction practices, for example, building up instead of out, to reduce their stormwater impact. Rain gardens, bioretention, and infiltration planters that promote infiltration of stormwater, and allow for evapotranspiration to occur. Porous pavements that allow stormwater to infiltrate where traditional impervious pavements would otherwise be used. Vegetated swales and bioswales that treat stormwater runoff as it flows through these channels. Green roofs that absorb and store rainfall, thereby reducing runoff volume. Green roofs also help reduce energy costs. Trees and tree boxes that help break up the landscape of impervious surfaces and absorb stormwater runoff. 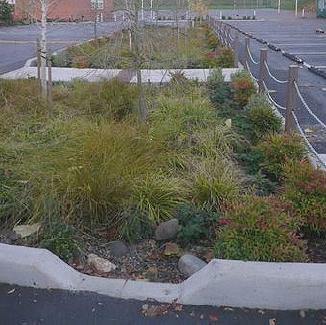 Pocket wetlands that are designed to treat stormwater. Reforestation and revegetation practices that help restore areas to more natural vegetative cover, which promote infiltration. Protection and enhancement of riparian buffers and floodplains that ensures that streams are protected and shaded, improving water quality. Rainwater harvesting that uses cisterns and rain barrels to capture and use stormwater for irrigation, air conditioning cooling water, and non-potable indoor uses such as watering plants. Click here to view or download the new guidance document.